In this book, the famous Russian scientist, Sergei Kapitsa, explains complicated theories in an uncomplicated manner that is easily accessible to readers with no specialist knowledge. The author focuses on the processes taking place inside the global demographic revolution and on the destinies of nations, mankind and our planet as a whole. 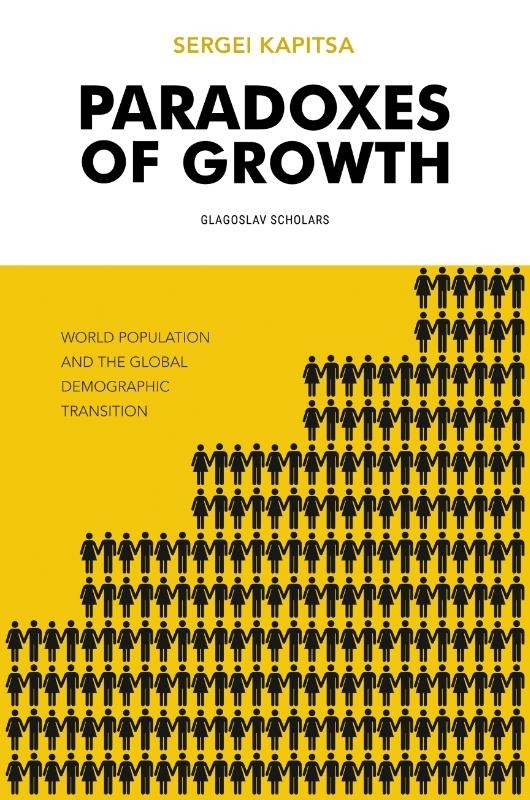 The author cites a number of facts and assessments concerning not only projections for population growth, but also a common view on the causes of the current and future crises, and on food and energy problems. The book Paradoxes of Growth addresses the vital problems of a global demographic revolution, when humanity moves into a period of limited reproduction. The answer to the questions of why this happens, and what the consequences of it might be, affects not only the distant future, but also our approach to solving the problems of modernity, and in particular our analysis of the causes and results of the global crisis. In his book, Sergei Kapitsa examines the concept of the model and the main results of the mathematical modelling which led to the theory of growth of the world's population, and offers an interpretation of history and of the development of humanity, the present and the future that likely awaits us. The discussion of global issues is not intended to be a comprehensive analysis; rather, it serves to reveal the opportunities offered by a quantitative analysis of the history of the world. The concept developed by Kapitsa concerns human civilization as a whole and may provide certain forecasts for communities - in the broadest sense of the world - and nations, as well. Edited by Scott Moss and Huw Davies. Sergei Kapitsa was an outstanding Soviet and Russian scientist, professor and TV presenter. During his lifetime he was responsible for 14 inventions and 1 discovery and wrote hundreds of books and articles which were published in many languages around the world. He conducted scientific research and worked in numerous fields of science (aerodynamics, magnetism, applied electrodynamics, nuclear physics, the history of science and demographics, to name but a few). Professor Kapitsa was one of the founding fathers of the science of cliodynamics and the creator of the phenomenological mathematical model of hyperbolic growth of the world population and the global demographic transition. For hosting his TV program "Evident, but Incredible" for many years, Kapitsa was awarded second place in the Guinness Book of Records and first place in the Russian Book of Records. In 2008, Kapitsa received a special TEFY award for his personal contribution to the development of Russian television. Sergei Kapitsa was a member of the Academy of Natural Sciences, the European Academy of Sciences, the European Physics Society, the World Institute of Science, the International Astronautical Federation, the European Academy, the International Academy of Humanism, the Manchester Literary and Philosophical Society, the World Academy of Arts and Sciences, the International Commission on Culture and Development and a number of other societies and committees.